"Could you give me a push, please?" An international trailer has arrived for the film Eddie the Eagle, which sounds so much like it's going to be a comedy but is actually a drama about the story of the ski jumper who was the first Olympian to represent Great Britain in ski jumping during the 1988 Winter Olympics in Calgary. Taron Egerton (seen in Kingsman) plays "Eddie the Eagle", also featuring Hugh Jackman, Christopher Walken, Tim McInnerny and others. This actually looks fun to watch in, dare I say this, a Cool Runnings way - the underdog story of an Olympian that no one believed in. This might be Egerton's moment to really shine again, as he looks excellent in this. Consider me sold on seeing this, I'm intrigued. Eddie the Eagle is directed by Dexter Fletcher (Sunshine on Leith) and written by first-time scribes Simon Kelton and Sean Macaulay. 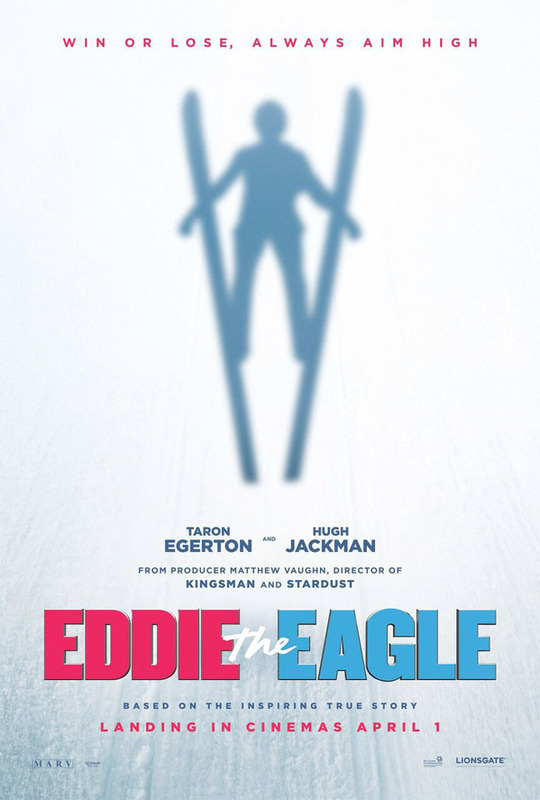 The biopic tells the story of Eddie Edwards (Taron Egerton), the first competitor to represent Great Britain in Olympic ski jumping during the 1988 Winter Olympics in Calgary. Trained by ski expert Chuck Berghorn (Hugh Jackman), he was a particular dark horse to achieve this placement, since he had no funding and his farsightedness forced him to wear glasses under his goggles, making him virtually blind. In competing, his placement of dead last made him a heroic failure. The film is currently scheduled to open in US theaters starting February 26th, 2016 early next year. Stay tuned for updates. Any interest? Ha, I wish I knew them! Nah. I just love that film, too. If only rampant alcoholism and not really being any good were qualities that worked in modern athleticism. As a kid I remember him, he was a really bizarre character. ahh a film about an english ski jumper and i cant access it in england.